This book by Australian author Karen Viggers took me out of my comfort zone a little as it’s a departure from my usual crime fiction / suspense genre. Having said that I do read quite a bit of general fiction nowadays but usually shy away from books showcasing all-things-fauna and flora, knowing that my mind skims detail and descriptions that normal people would find enticingly beautiful. But of course I had no need to worry. It actually irks me that I am increasingly wrong about books and my reading taste. I’m not even judging them by the cover (as per the age-old adage) rather I get mislead by the blurb and / or title, so it’s a reminder that we need to nudge those boundaries some of us (ie. me) establish from time to time. I initially found it hard to believe people like Kurt and Miki could exist in today’s society; that someone would understand so little of their rights and the ways of the world that they’d exist in a bubble. Of course, the fact that Miki has been so sheltered is the entire issue itself I guess. Most of us can access everything and anything – whether we like it or not… even more so in the age of the world wide web. ‘How the other half live’ is at our fingertips (literally), not only what we’ve been exposed to as we go about our everyday lives. I liked Leon and wonder if perhaps he’d popped up in The Lightkeeper’s Wife as there’s reference to him visiting an old woman and hearing her stories. (I’ve not read any of Viggers’ previous work). More than anything I liked him as a person and my first thought was that he seemed like a really decent bloke. Viggers writes him with pragmatic realism and because we’re seeing events and people from his point of view and privy to his thoughts – about his parents, his grandfather, his neighbours, the community, the forest itself as well as his job – we get a really good understanding of who he is. Similarly with Miki, although I found it unfathomable that she could have existed in such a bubble (for almost all of her 18yrs) the way she starts discovering the ‘outside’ world felt very authentic. Very real. As we’re in her head as well we get to travel that path with her, as well as her own ‘coming of age and independence’ story – not just in the traditional sense – but in understanding her brother and the need to break family ties (and lies) ingrained for so long. I really loved how Viggers mirrors Miki’s (secret) reading fodder with her own evolution. Miki’s discussions with ex-teacher and volunteer at the local information centre Geraldine offer up this important reminder. And then of course there’s Max, the young boy living next door who Leon takes under his wing. There’s a real sense that Theo comes into Max’s life at the right time and as we also see some of the events of this book through Max’s eyes we realise that he (and kids in general I guess) understands far more than we realise. I came to really care about our three lead characters and liked the support cast. Their stories were all very real and Miki and Leon came with a lot of backstory so it’s easy to engage with them and get invested in their lives. Leon’s grandfather and Geraldine deserve a special mention for the pivotal roles they play in Leon and Miki’s lives – respectively. I’ve admitted I’m not a huge lover of nature – of flora and fauna – so I don’t appreciate the detail that’s gone into the description of the forest and the passion that forestry vs preservation evokes. I mean, I understand that we shouldn’t be tearing down all of our trees but skimmed more of the descriptive detail than I should. There’s possibly a tinge of preaching when it comes to wildlife (although I don’t disagree with Viggers’ point of view); but she offers up a very balanced view of the cliched ‘greenies vs loggers’ debate, and the issues of over-deforestation vs a need to consider economic and social repercussions of ridding communities of industry. I loved that this book offers up a microcosm of community in a sense… a study in small town life – the secrets residents keep, the battles they wade into and those they avoid. And it has to be said, even if I don’t appreciate it as much as I should, Viggers does a great job at reflecting the beauty of Tasmanian forests. 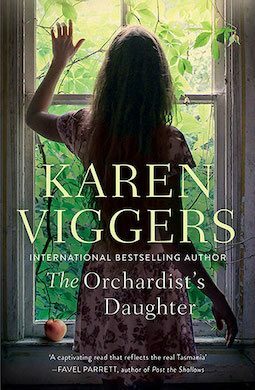 The Orchardist’s Daughter by Karen Viggers was published in Australia by Allen & Unwin and is now available.